Adaptive radio is radio in which communications systems have a means of monitoring their own performance and modifying their operating parameters to improve this performance. The use of SDR technologies in an adaptive radio system enables greater degrees of freedom in adaptation, and thus higher levels of performance and better quality of service in a communications link. Cognitive radio is radio in which communication systems are aware of their internal state and environment, such as location and utilization on RF frequency spectrum at that location. They can make decisions about their radio operating behaviour by mapping that information against predefined objectives. Cognitive radio is further defined by many to utilize Software Defined Radio, Adaptive Radio, and other technologies to automatically adjust its behaviour or operations to achieve desired objectives. The utilization of these elements is critical in allowing end-users to make optimal use of available frequency spectrum and wireless networks with a common set of radio hardware. This will reduce cost to the end-user while allowing him or her to communicate with whomever they need whenever they need to and in whatever manner is appropriate. Intelligent radio is cognitive radio that is capable of machine learning. This allows the cognitive radio to improve the ways in which it adapts to changes in performance and environment to better serve the needs of the end user. 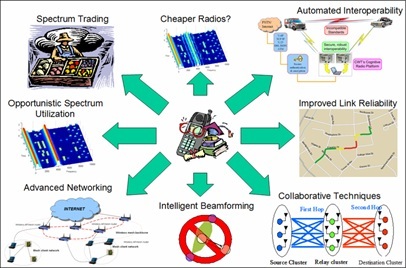 In addition to utilizing SDR technologies, adaptive radio, intelligent radio and cognitive radio systems may all support dynamic spectrum access (DSA), allowing the systems to select the frequency spectrum in which they will operate at a given location and over a given period of time to optimize the use of available spectrum and avoid interference with other radios or other systems.